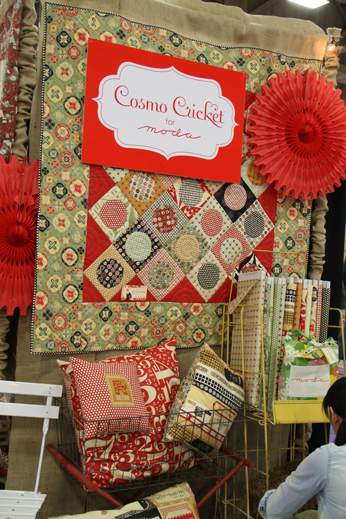 Welcome Cosmo Cricket to the talented design team at Moda Fabrics. A love of letters was the starting point for Circa 1934, the line of fabric for Moda designed by Eric and Julie Comstock, the husband-and-wife team who go by the name Cosmo Cricket. Eric developed an enduring affinity for typography when he worked as a typesetter in an old print shop during his college years. Circa 1934 started with typewriter key cap imagery, as well as numbers in a lively, high-contrast typeface so popular during the 1930s. It grew to include design elements like ceiling tiles and moldings found in the building that housed the old type blocks. “Our designs often work this way,” says Julie. “It’s a very organic process.” The result is a line of fabric with elements bold and graphic, as well as sweetly detailed. Sharing ideas comes easily for Eric and Julie, who work at back-to-back desks in their home studio. They have distinct personal styles—Eric favors a clean, modern look while Julie’s most at home with a vintage, cottage-y vibe. By melding those two perspectives, Cosmo Cricket’s created a distinctive look that can be found on posters, gift wrap, online photo books, and more. Circa 1934 is their first line of fabric for Moda, and Julie is especially thrilled. “Whenever we design something, I always tell Eric I’d love to see it in fabric,” she says. 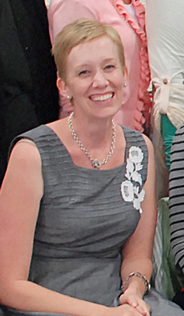 For years Julie sewed curtains and pillows for their home and she also enjoyed designing and sewing clothing for their four children, as well as some of her own. Work has kept her from the sewing machine lately, but seeing precuts of Circa 1934 is inspiring a return to stitching. Project shown will be in a future Quilts N More issue. Ask for Circa 1934 from your favorite retailer, September 2011. Moda Fabrics/United Notions (http://www.unitednotions.com), located in Dallas, TX, are manufacturers and distributors of quilting fabrics, notions, pattern books, finished textile products, and quilting supplies. I for one can’t wait for this line to come out. So excited for this line, and that they are now with Moda.